Yokogawa Electric Corporation (TOKYO: 6841) announces it has introduced an on-demand hydrate risk management solution that helps offshore oil platform operators to maintain production levels, protect plant assets, and minimize operating expenses and downtime by optimizing pipeline chemical injection. The new solution integrates industry-leading simulation software from KBC, a wholly-owned subsidiary, with Yokogawa's flexible supervisory control & data acquisition (SCADA) software to deliver a dashboard that enables consolidated, on-demand monitoring. Automated chemical injection metering valve technology can also be integrated as required. During the plant design phase of oil and gas offshore platforms, modeling and simulation software and pre-operation field test data is utilized to optimize the pipeline network design and calculate the amount of inhibitor required to prevent hydrate formation. During operations too, field operators use the simulation results to calculate the amount of inhibitor to be injected into the flow. Injection rates are regularly reviewed by field experts, but without real-time visibility into the actual state of the pipeline, operators tend to overdose the inhibitor to provide a sufficient buffer for daily operational conditions and to compensate for changes in field properties over time. This can result in excessive chemical use and increased operating expenses. 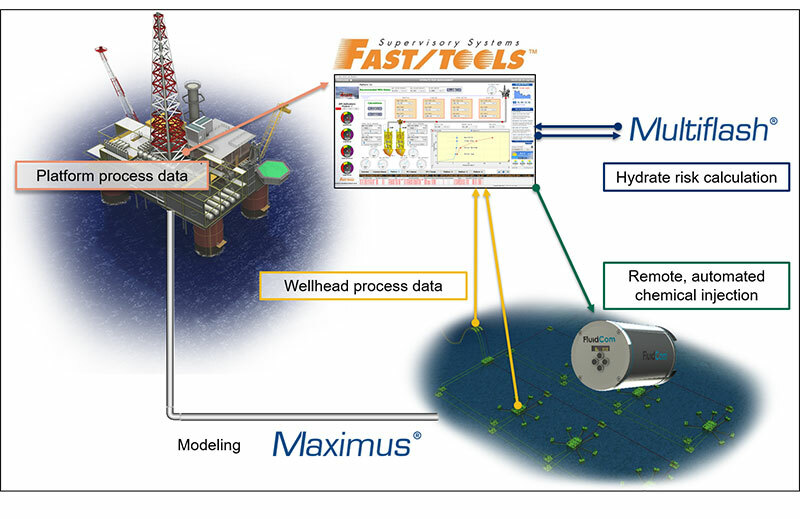 With the aim of enabling more efficient hydrate risk management, Yokogawa has developed a common dashboard for KBC's two advanced, complementary simulation software solutions, Maximus® and Multiflash®, and Yokogawa's own FAST/TOOLS™ SCADA system, making on-demand flow assurance a possibility for the first time. KBC's Maximus is a purpose-built tool for compositional thermal hydraulic steady state simulations of pipeline networks, including wells, choke valves, flowlines and a wide range of processing equipment. It can be used as both a production forecaster and flow assurance tool by predicting physical conditions of the network. Multiflash is the de facto standard pressure-volume-temperature (PVT) modeling solution for hydrocarbon flow assurance and production modeling due to its scope and accuracy. It is used to evaluate the phase behavior and physical and transport properties of complex mixtures and pure substances, and excels in modeling multi-phase hydrocarbon mixtures. Used as an integrated SCADA system within and between plants, FAST/TOOLS offers the ability to work with and present information from various data sources and applications on a single dashboard. In this solution, data from temperature and pressure sensors in the subsea wellhead, pipeline(s) and offshore platform are collected by FAST/TOOLS and sent to KBC's simulation software continuously or when operators require up-to-date hydrate formation risk information. Based on the results, FAST/TOOLS then displays the level and specific location of hydrate risk, and provides operators with the current hydrate formation curve and key performance indicators in one unified dashboard. In addition, the solution calculates the recommended level of inhibitor injection that enables them to balance risk and cost with a given margin. Integrating the KBC simulation and modelling technology with Yokogawa's flexible SCADA platform enables operators to quickly make informed decisions about inhibitor injection volumes by getting the information they need on demand, without having to rely on periodic engineer analysis. Customers also have the option of leveraging the precise, automated FluidCom™ chemical injection metering valve technology of subsidiary Yokogawa TechInvent AS to achieve an end-to-end hydrate risk management solution. The on-demand hydrate risk management solution will be demonstrated at ONS 2018, a major international exhibition and conference for the oil and gas industry being held from August 27 to 30 in Stavanger, Norway. The solution is available for delivery from Yokogawa immediately; interested parties should contact their regional Yokogawa office. KBC, a wholly-owned subsidiary of Yokogawa Electric Corporation, is all about excellence in the Energy and Chemical industry. We make excellence real for our customers through the actions of our people fused with our technology and best practices. We provide leading software and expert services, powered by the cloud, to assure process operations achieve their full potential. Our customers achieve operating performance that surpasses ordinary standards, now and into the future. For more information, please visit www.kbc.global.